Rwanda is among the three countries in the world with mountain gorillas. These greatly endangered species live in the jungles of volcanoes national park that is located in northwestern Rwanda. Volcanoes national park is located in the Virunga area and has three major Virunga volcanoes – Karisimbi, Mikeno, and Bisoke. Of the estimated 400 mountain gorillas in the Virunga area, about 300 inhabit the forested gentle slopes of volcanic mountains in volcanoes national park. The park has a total of 10 habituated mountain gorilla families that are open to tourist visitation while two mountain gorilla families were left for research. The habituated mountain gorilla families are trekked by a group of 8 tourists every day and are expected to spend strictly an hour with them. Below are the habituated mountain gorilla families in volcanoes national park. This family initially had 13 mountain gorilla members hence deriving the name 13 group however the mountain gorilla numbers increased and today the family has 25 individual members including a dominant silverback, 12 females, 3 youth gorillas, and 7 young ones. The dominant silverback Agashya won the leadership crown after overpowering the then group leader Nyakairima in a deadly fight. After winning, Agashya decided to move the gorilla family uphill for protection against any intruders. Agashya is very ambitious and with his efforts, he managed to increase the mountain gorilla numbers in his family from 12 to 25. Agashya is very protective of his gorilla family and once he senses any danger and intrusion, he moves with the whole mountain gorilla family uphill. This sometimes makes it harder for tourists to trek this gorilla family. This mountain gorilla family lives at a relatively higher altitude and most challenging mountain gorilla group to trek. The family was researched on and made famous by Dian Fossey an American zoologist who had taken long studying the mountain gorillas in Rwanda with her research base at Karisoke. 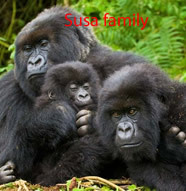 This mountain gorilla family was named Susa after river Susa that flows in the proximity of this mountain gorilla family. The Susa gorilla family has some of the oldest habituated mountain gorillas and it’s very famous for her twin mountain gorillas (Impano and Byishimo). Since the Susa family is hard to get to, it can be best trekked by the physically fit and adventurous tourists capable of hiking for a long time. For easy trekking of the mountain gorillas in the Susa family, trackers first go ahead of the tourists to trace where the family is and then directs the tourists accordingly. Trekking the Susa family is offers exciting moments especially as tourists watch the twin mountain gorillas jump and play around. Other gorilla individuals in the family have seen either feeding or relaxing around the thickets. With 17 individual mountain gorillas, Amahoro is the most peaceful mountain gorilla family that also lives on a gentle slope. 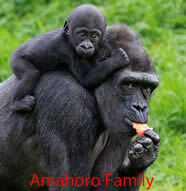 The word Amahoro means peaceful and the dominant silverback (Ubumwe) is indeed very peaceful. Of the 17 mountain gorillas in the Amahoro family, there is one silverback – Ubumwe, 2 black backs (sexually mature male mountain gorillas), 5 young ones, 5 female gorillas, and 4 youth mountain gorillas. Getting to this gorilla group is a little hectic because it also involves hiking however all the tourists who have visited the group always take about their unique experiences and encounters. This gorilla family shifted from the Democratic Republic of Congo and it’s made up of 18 mountain gorilla members including Kwitonda the dominant silverback. It’s among the difficult gorilla families to trek because it most times it keeps far away in thickly forested areas that can not be easily accessed by tourists. 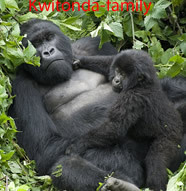 Kwitonda is a Kinyarwanda word that means the humble one that clearly describes the character of the group and the silverback. Being the biggest and obviously stronger, Guhonda is the dominant silverback of the Sabyinyo group and has for a long time managed to keep its major rival silverback Ryango in isolation from the major group. 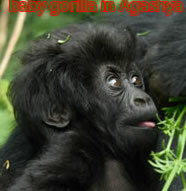 The Sabyinyo gorilla family mainly has 3 female mountain gorillas, 2 youthful gorillas, and a young mountain gorilla. 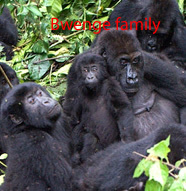 With a total of 11 mountain gorilla members, Ugenda family inhabits the Karisimbi volcanic area and has 2 silverbacks. 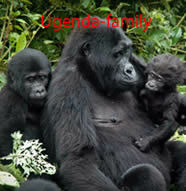 This mountain gorilla family is also difficult to trek because it always moves from one area to another thus the name Ugenda that explains the family’s characteristic.